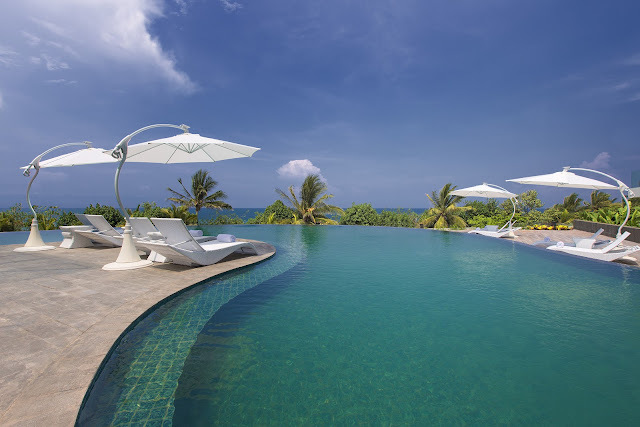 Sheraton Hotels & Resorts, part of Starwood Hotels & Resorts Worldwide, Inc. (NYSE: HOT), December 7, 2012 announced the opening of the Sheraton Bali Kuta Resort on Kuta Beach, one of world’s renowned surfer’s paradise in Bali. Sheraton as part of ‘Sahid Kuta Lifestyle Resort’ is transforming the Kuta experience and presenting an all new contemporary vision of paradise for travelers. Set on a total area of 5.2 hectares of development, the hotel is located directly at the heart of Kuta beach with pristine Indian Ocean scenery. Owned by PT. Indonesian Paradise Island, the Sheraton in Bali is part of beachwalk – a luxurious shopping destination, presenting over 200 retail outlets in an open-air style and designed architecture inspired by the design of Bali’s rice paddy field. Centrally located at the heart of Pantai Kuta and just 5 kilometers away from Bali Ngurah Rai International Airport (DPS), the resort’s elevated position on the island provides amazing ocean and beach views. Sheraton Bali Kuta Resort marks Starwood’s fifth hotel on the Island of Gods. Currently, Starwood manages The St. Regis Bali Resort, W Retreat & Spa Bali – Seminyak, The Laguna, A Luxury Collection Resort, and The Westin Resort Nusa Dua, Bali. By 2014, Starwood will debut three new hotels in Bali, marking a total of eight hotels representing six of Starwood’s lifestyle hotel brands. .
Sheraton Bali Kuta Resort houses three dining venues where travelers can enjoy Sheraton’s signature restaurants – the all-day dining Feast® with its vibrant open-kitchen, located alongside beachwalk patio overlooking the Kuta Beach, or indulge at Bene - a light-hearted Italian trattoria with oceanic setting, where guests can also relish mesmerizing views of the beautiful Bali Strait on the rooftop deck level. The Lounge offers a locally inspired cocktail menu, with open-air setting and Indian Ocean scenery. To keep travelers fit and energized, Sheraton Bali Kuta Resort introduces Sheraton Fitness by Core Performance™ with lifestyle designed training programs and encompassing a fully equipped fitness center, Shine Spa for Sheraton that will pamper and rejuvenate guests with signature treatments blending from the East to the West with local Balinese touches and Color Your Plate™ a simple three colors approach to a healthy food program. With a total of over 1,600 square meters all located on one level, Sheraton Bali Kuta Resort offers 9 flexible event spaces - including a 700 square meters ballroom that is divisible and supported with an underground secure parking facility capable of hosting over 2,000 vehicles. In addition the meeting spaces are equipped with state-of-the-art technology, including broadband or wireless high-speed Internet Access. Travelers can stay connected with the exclusive Link@Sheraton® experienced with Microsoft® that provides a connectivity hub, with complimentary Wi-Fi and Personal Computer stations. 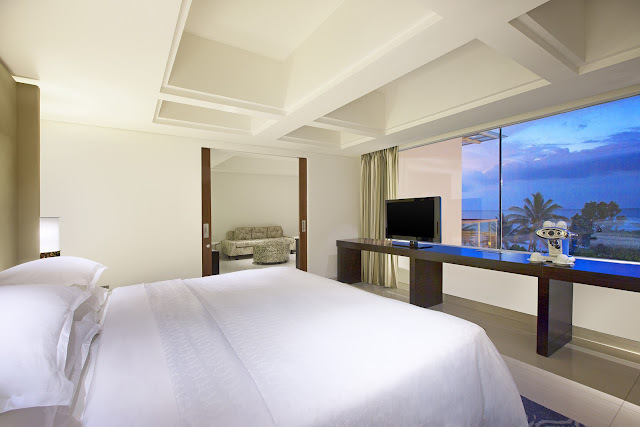 In celebration of its opening, Sheraton Bali Kuta Resort is offering ‘Experience Sheraton’ package. Starting from USD225++ per night, the package includes accommodation in a deluxe guestroom, breakfast for two at Feast®, one-way airport transfer from or to Bali International Ngurah Rai Airport (DPS), daily resort credit of USD25 to indulge in various food and beverage offerings or spa treatments. Starwood Preferred Guest (SPG) earns double Starpoints. The offer is valid until 30 June 2013. Rates are subject to 21% service charge and government tax. Terms and conditions apply. For more information and reservation about Sheraton Bali Kuta Resort, please visit www.sheraton.com/balikuta. Sheraton helps guests make connections at more than 400 hotels in 70 countries around the world and recently completed a $6 billion global revitalization and is now in the midst of a $5 billion global expansion over the next three years. Sheraton is owned by and is the largest and most global brand of Starwood Hotels & Resorts Worldwide, Inc., one of the leading hotel and leisure companies in the world with 1,128 properties in 100 countries and territories with 154,000 employees at its owned and managed properties. Starwood Hotels is a fully integrated owner, operator and franchisor of hotels, resorts and residences with the following internationally renowned brands: St. Regis®, The Luxury Collection®, W®, Westin®, Le Méridien®, Sheraton®, Four Points® by Sheraton, and the recently launched Aloft®, and Element SM. The company boasts one of the industry’s leading loyalty programs, Starwood Preferred Guest (SPG), allowing members to earn and redeem points for room stays, room upgrades and flights, with no blackout dates. Starwood Hotels also owns Starwood Vacation Ownership, Inc., one of the premier developers and operators of high quality vacation interval ownership resorts. For more information, please visit www.starwoodhotels.com.